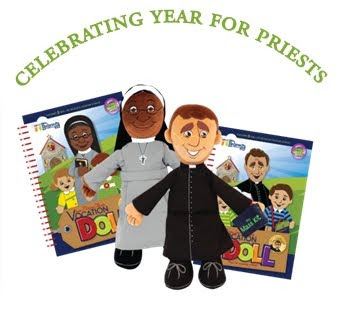 On January 5th, the makers of the "Wee Believers" Vocation Dolls, Steve and Joni Abdalla will be featured in a live interview on the CatholicTV Talk Show "This is the Day". Wee Believers is a Catholic toy company which is best known for the toy Mass Kit it produces. Steve and Joni were first inspired by their children to make Catholic toys which would help with the spiritual growth and formation of children. This episode of “This is the Day” will stream live at www.CatholicTV.com and on CatholicTV where available on January 5th at 10:30AM ET. The show will be rebroadcast at 8PM the same day and will also be added to the website archives the same day. Each Wee Believers product is accompanied by a companion booklet, written to compliment the particular toy with relevant and educational material. The vocations dolls "Sr. Mary Clara" and "Fr. Juan Pablo" dolls, are accompanied by a booklet featuring the real-life vocation stories of five priests and five religious Sisters.